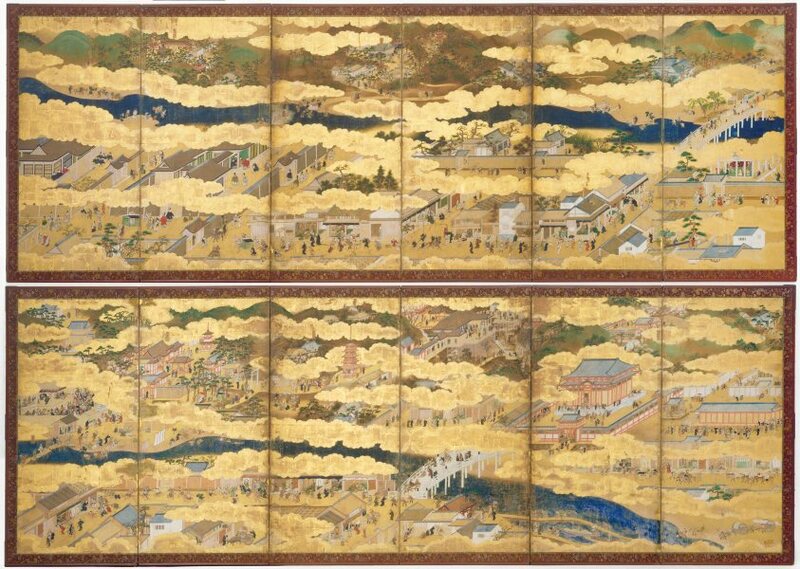 Following a long period of strife and civil wars in the fifteenth century, the ancient political and cultural capital of Kyoto was restored to its earlier splendour in the sixteenth and seventeenth centuries. This reconstruction is documented and lauded in screens such as these which, in their panoramic view, record with accuracy and detail the features of the city. Looking eastwards across the Kamo River towards the Higashimaya hills, the area beyond the river at the top of the screens is rakugai (without the city), while the area below is 'rakuchû' (within the city). 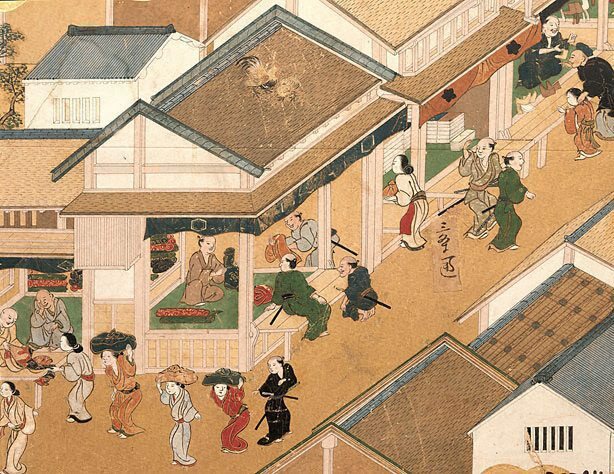 The lower section of each screen illustrates the busy mercantile life of Kyoto, with the townspeople going about their business in stores and workshops. On the far left of the left screen is the Imperial Palace. Art Gallery Handbook, 1999. pg. 271. Edmund Capon, The Connoisseur , 'Far Eastern Art in the Art Gallery of New South Wales', pg. 22-29, London, May 1980, 29 (colour illus.). Bruce James, Art Gallery of New South Wales handbook , 'Asian Collection: East Asia', pg. 246-287, Sydney, 1999, 271 (colour illus.). Two images are depicted on pg. 271. 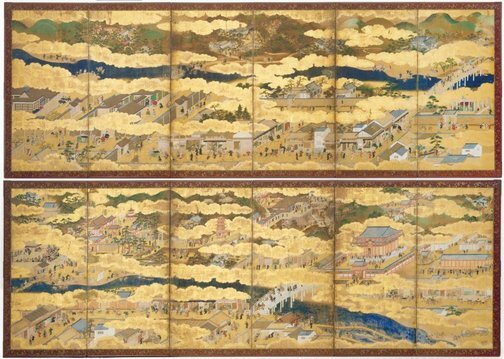 Image depicts part 1 and a detail of part 1 of the screen. Jackie Menzies, AGNSW Collections , 'Asian Art - India, South-East Asia, China, Tibet, Korea, Japan', pg. 173-228, Sydney, 1994, 216 (colour illus.). Jackie Menzies, The Australian Antique Collector , 'Recent Japanese Acquisitions at the Art Gallery of New South Wales', pg. 90-95, Chippendale, Jan 1981-Jun 1981, 90-1 (colour illus.). Jackie Menzies., Art Gallery of New South Wales collection series 2 , 'Japanese, Edo period: Views in and around Kyoto', Sydney, 1982, colour illus., illus.. fig.no. 1, fig.no. 2 detail, fig.no 3 detail. Jackie Menzies, Three years on: a selection of acquisitions 1978-1981 , 'Asian Art', pg. 85-103, Sydney, 1981, 95 (colour illus), 95 (illus.). cat.no. 18. The colour image is a detailed image of this work. Portrait of a Gallery , 'Asian Art', pg. 106-113, Sydney, 1984, 111 (colour illus.). Nihon Byobu-e Shusei , Tokyo, 1978, 90-91 (illus.). The Asian Collections Art Gallery of New South Wales , 'The World of Samurai Culture', Sydney, 2003, 214-215 (colour illus.). The colour illus. on page 215 is a detail of this work. Adventures in Asia. An education kit for the Asian gallery , Sydney, 2003, 10 (colour illus. ), verso (illus.). card no.10; the colour illus. on card 10 is a detail of this work. Asian Collection Handbook, Art Gallery of New South Wales , 'Japanese Painting', pg. 53-69, Sydney, 1990, 53 (colour illus. ).